Nicolas Trudgian's action packed painting shows an attack on Rabaul during the fall of 1943. B-24 Liberators of the Army Air Force pound the harbor and docks below whilst the Marines Corps pilots of VMF 214 - the famous Black Sheep Squadron - provide top cover in their F4U Corsairs. A fierce dog-fight has developed between the F4U pilots and Japanese Zeros. One Zero, already smoking, begins to roll out of control, while the two F4U pilots turn their attentions on to a second. Below further dog-fights are in progress, the air filled with aerial combat. 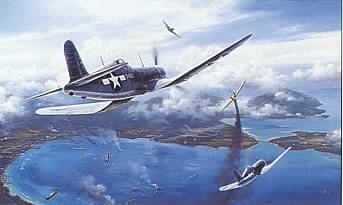 Each print is signed by the artist and FOUR Marine Corps F4U Corsair pilots who flew in combat in the Pacific.